8 Color Rotogravure Printing Machine (Roto or Gravure for short) is a type of intaglio printing process, which involves engraving the image onto an image carrier. In gravure printing, the image is engraved onto a cylinder because, like offset printing and flexography, it uses a rotary printing press. Once a staple of newspaper photo features, the rotogravure process is still used for commercial printing of magazines, postcards, and corrugated (cardboard) product packaging. The first step of Gravure is to create the cylinder with the engraved images that need to be printed: the engraving process will create on the cylinder surface the cells that will contain the ink in order to transfer it to the paper. Since the amount of ink contained in the cells corresponds to different colour intensities on the paper, the dimensions of the cells must be carefully set: deeper cells will produce more intensive colours whereas less deep cells will produce less intensive ones. There are three methods of photoengraving that have been used for engraving of gravure cylinders, where the cell open size or the depth of cells can be uniform or variable. 8 Color Rotogravure Printing Press is used in flexible packaging manufacturing and printing process including polyester, Nylon, Bopp, Foil, low and high density polyethylene polypro plane and paper with two sided printing facilities with high speed hot air dryers. The high speed rotogravure printing machine has the great flexibilities and high resolution color combination at faster rate. The rotogravure printing machine is well designed for precision engineering for best industry standard requirements of valued clients with technical excellence, easy machine operations with good efficiency and performance, high durability and reliability with standard parts made from sturdy materials. 8 Color Rotogravure Printing Press is designed to support flexible packaging film manufacturing industry. Rotogravure print plant is an expert supplementary solution that can be added to the existing flexible packaging film plant as it can print on variety of materials including paper, flexible films, aluminum foils, etc. Rotogravure printing line is a suitable choice to print on lamination lines made of different ingredients. Investing on this supplementary machine is a favorable opportunity to reduce the cost of secondary packaging requirements. Introducing sensitization resin as Rotogravure Printing Plate & Machines, it is suitable for printing, such packing materials as polyethylene, polypropylene bag, and cellophane and roll paper. It is a kind of ideal printing equipment for producing paper packing bags for food, supermarket handbags, vest bags and clothes bags. The layout of a Multi Color Rotogravure Printing Machine Manufacturer press follows an in-line arrangement where the required number of printing units is installed along a horizontal plane. Our company is considered a noted manufacturer and supplier of 6 Colour Rotogravure Printing Line Machine that can be attained in several models at most reasonable price. This efficient printing machine requires space in accordance with the machine size and number of color stations. Furthermore, it performs flawless printing on a varied range of materials such as foil, paper, BOPP, polyester and film. Individual gear box with enclosed oil bath lubrication is provided at each printing station. Pneumatically loaded pressure application with independent pressure control at both ends. One Impresion rubber roll with 60-65 shore hardness is provided at all stations. Designed for quick and easy changeovers. In cooperated with Special Nozzle Drying System featuring constant width continuous slot. Manual side lay (lateral) register by means of a mounting blocks on the operator side. One idler roller is radially adjustable at the entrance of each printing unit. Horizontal, Vertical & Angular adjustment to cover the full range of printing roller circumference. Mounted on a horizontal base for easy removal & cleaning operations. To isolates the web tension between the last printing station & rewinder this unit is provided immediately after last printing station..
One No. Pneumatically loaded rubber roll assembly dynamically balanced. Maximum reel outer diameter is 800 mm, and maximum reel weight is 300 kgs. Shaft for 76mm core i.d is provided. Full width lay on roller to assist rewinding from core to maximum reel diameter. The policy made by the company makes us engaged in offering a quality assured range of 8 Color Rotogravure Printing Press Machine. These machines are sturdy on design and are exceptionally valued by our precious clients. Besides being manufactured from pristine grade components and the latest technology, these are inspected properly by our quality examiners. Machines offered by us are available with us in several models at most reasonable price. Rotogravure Printing Machine is used in flexible packaging manufacturing and printing process including polyester, Nylon, Bopp, Foil, low and high density polyethylene polypro plane and paper with two sided printing facilities with high speed hot air dryers. The high speed rotogravure printing machine has the great flexibilities and high resolution color combination at faster rate. The rotogravure printing machine is well designed for precision engineering for best industry standard requirements of valued clients with technical excellence, easy machine operations with good efficiency and performance, high durability and reliability with standard parts made from sturdy materials. Rotogravure printing machine is designed to support flexible packaging film manufacturing industry. Rotogravure print plant is an expert supplementary solution that can be added to the existing flexible packaging film plant as it can print on variety of materials including paper, flexible films, aluminum foils, etc. Rotogravure printing line is a suitable choice to print on lamination lines made of different ingredients. Investing on this supplementary machine is a favorable opportunity to reduce the cost of secondary packaging requirements. Introducing sensitization resin as Rotogravure Printing Plate & Machines, it is suitable for printing, such packing materials as polyethylene, polypropylene bag, and cellophane and roll paper. It is a kind of ideal printing equipment for producing paper packing bags for food, supermarket handbags, vest bags and clothes bags. This is our high speed 8 color rotogravure printing machine with 5 drive, web video & auto registration control system. It''s a very nice & high profile machine. The first step of Gravure is to create the cylinder with the engraved images that need to be printed: the engraving process will create on the cylinder surface the cells that will contain the ink in order to transfer it to the paper. Since the amount of ink contained in the cells corresponds to different colour intensities on the paper, the dimensions of the cells must be carefully set: deeper cells will produce more intensive colours whereas less deep cells will produce less intensive ones. There are three methods of photoengraving that have been used for engraving of gravure cylinders, where the cell open size or the depth of cells can be uniform or variable. The policy made by the company makes us engaged in offering a quality assured range of Multi Color Rotogravure Printing Machine. These machines are sturdy on design and are exceptionally valued by our precious clients. Besides being manufactured from pristine grade components and the latest technology, these are inspected properly by our quality examiners. Machines offered by us are available with us in several models at most reasonable price. The first step of Gravure is to create the cylinder with the engraved images that need to be printed: the engraving process will create on the cylinder surface the cells that will contain the ink in order to transfer it to the paper. Since the amount of ink contained in the cells corresponds to different colour intensities on the paper, the dimensions of the cells must be carefully set: deeper cells will produce more intensive colours whereas less deep cells will produce less intensive ones. There are three methods of photoengraving that have been used for engraving of gravure cylinders, where the cell open size or the depth of cells can be uniform or variable Multi Color Rotogravure Printing Press Machine is used in flexible packaging manufacturing and printing process including polyester, Nylon, Bopp, Foil, low and high density polyethylene polypro plane and paper with two sided printing facilities with high speed hot air dryers. The high speed rotogravure printing machine has the great flexibilities and high resolution color combination at faster rate. The rotogravure printing machine is well designed for precision engineering for best industry standard requirements of valued clients with technical excellence, easy machine operations with good efficiency and performance, high durability and reliability with standard parts made from sturdy materials. 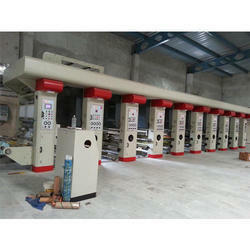 Multi Color Rotogravure Printing Press Machine is designed to support flexible packaging film manufacturing industry. Rotogravure print plant is an expert supplementary solution that can be added to the existing flexible packaging film plant as it can print on variety of materials including paper, flexible films, aluminum foils, etc. Rotogravure printing line is a suitable choice to print on lamination lines made of different ingredients. Investing on this supplementary machine is a favorable opportunity to reduce the cost of secondary packaging requirements. Introducing sensitization resin as Rotogravure Printing Plate & Machines, it is suitable for printing, such packing materials as polyethylene, polypropylene bag, and cellophane and roll paper.It is a kind of ideal printing equipment for producing paper packing bags for food, supermarket handbags, vest bags and clothes bags. The policy made by the company makes us engaged in offering a quality assured range of Multi Color 4 To 8 Color Rotogravure Printing Machine. These machines are sturdy on design and are exceptionally valued by our precious clients. Besides being manufactured from pristine grade components and the latest technology, these are inspected properly by our quality examiners. Machines offered by us are available with us in several models at most reasonable price. Rotogravure Printing Machine is used in flexible packaging manufacturing and printing process including polyester, Nylon, Bopp, Foil, low and high density polyethylene polyproplane and paper with two sided printing facilities with high speed hot air dryers. The high speed rotogravure printing machine has the great flexibilities and high resolution color combination at faster rate. The rotogravure printing machine is well designed for precision engineering for best industry standard requirements of valued clients with technical excellence, easy machine operations with good efficiency and performance, high durability and reliability with standard parts made from sturdy materials. Rotogravure Printing Machine is designed to support flexible packaging film manufacturing industry. Rotogravure print plant is an expert supplementary solution that can be added to the existing flexible packaging film plant as it can print on variety of materials including paper, flexible films, aluminum foils, etc. Rotogravure printing line is a suitable choice to print on lamination lines made of different ingredients. Investing on this supplementary machine is a favorable opportunity to reduce the cost of secondary packaging requirements. The policy made by the company makes us engaged in offering a quality assured range of 6 Color Rotogravure Printing Line Rotogravure Printing Press. These machines are sturdy on design and are exceptionally valued by our precious clients. Besides being manufactured from pristine grade components and the latest technology, these are inspected properly by our quality examiners. Machines offered by us are available with us in several models at most reasonable price. The roto printing machine is popular and mostly used in the fine arts and photography reproduction sectors because of its high density range in printing. The printing process is also commonly used in food manufacturing and the packaging sectors. The gravure printing machine can print a wide range of substrates some of which involve polyester, polythene and BOPP among others. The rotogravure machine is most popular in this sector because of its ability to print well on thin films such as nylon and polyester. The printing process is also applied in manufacture of wall covers and transfer printing. The process has further applications in the security printing, the sector and generally used the industrial sector. Automatic Rotogravure Printing Machine (Roto or Gravure for short) is a type of intaglio printing process, which involves engraving the image onto an image carrier. In gravure printing, the image is engraved onto a cylinder because, like offset printing and flexography, it uses a rotary printing press. Once a staple of newspaper photo features, the rotogravure process is still used for commercial printing of magazines, postcards, and corrugated (cardboard) product packaging. Automatic Rotogravure Printing Machine is designed to support flexible packaging film manufacturing industry. Rotogravure print plant is an expert supplementary solution that can be added to the existing flexible packaging film plant as it can print on variety of materials including paper, flexible films, aluminum foils, etc. Rotogravure printing line is a suitable choice to print on lamination lines made of different ingredients. Investing on this supplementary machine is a favorable opportunity to reduce the cost of secondary packaging requirements. This is our high speed 8 color rotogravure printing machine with 5 drive, web video & auto registration control system. It's a very nice & high profile machine. Rotogravure Line (Roto or Gravure for short) is a type of intaglio printing process, which involves engraving the image onto an image carrier. In gravure printing, the image is engraved onto a cylinder because, like offset printing and flexography, it uses a rotary printing press. Once a staple of newspaper photo features, the rotogravure process is still used for commercial printing of magazines, postcards, and corrugated (cardboard) product packaging. The first step of Gravure is to create the cylinder with the engraved images that need to be printed: the engraving process will create on the cylinder surface the cells that will contain the ink in order to transfer it to the paper. Since the amount of ink contained in the cells corresponds to different colour intensities on the paper, the dimensions of the cells must be carefully set: deeper cells will produce more intensive colours whereas less deep cells will produce less intensive ones. There are three methods of photoengraving that have been used for engraving of gravure cylinders, where the cell open size or the depth of cells can be uniform or variable. The layout of a gravure printing press follows an in-line arrangement where the required number of printing units is installed along a horizontal plane. Drying system: consisting of a chamber which dries the ink once it is on the substrate and prior to it reaching the next printing unit. Drier capacities are determined based on the required printing speed, ink type (solvent or water based), and ink lay down volume. Rotogravure Machine is used in flexible packaging manufacturing and printing process including polyester, Nylon, Bopp, Foil, low and high density polyethylene polypro plane and paper with two sided printing facilities with high speed hot air dryers. The high speed rotogravure printing machine has the great flexibilities and high resolution color combination at faster rate. The rotogravure printing machine is well designed for precision engineering for best industry standard requirements of valued clients with technical excellence, easy machine operations with good efficiency and performance, high durability and reliability with standard parts made from sturdy materials. Rotogravure printing machine is designed to support flexible packaging film manufacturing industry. Rotogravure print plant is an expert supplementary solution that can be added to the existing flexible packaging film plant as it can print on variety of materials including paper, flexible films, aluminum foils, etc. Rotogravure printing line is a suitable choice to print on lamination lines made of different ingredients. Investing on this supplementary machine is a favorable opportunity to reduce the cost of secondary packaging requirements. The information of Rotogravure Machine is provided for the purpose of guideline & indication only and doesn't form any kind of commitments. 8 Colour Rotogravure Printing Machine is used in flexible packaging manufacturing and printing process including polyester, Nylon, BOPP, Foil, low and high density polyethylene polypro plane and paper with two sided printing facilities with high speed hot air dryers. The high speed rotogravure printing machine has the great flexibilities and high resolution color combination at faster rate. The rotogravure printing machine is well designed for precision engineering for best industry standard requirements of valued clients with technical excellence, easy machine operations with good efficiency and performance, high durability and reliability with standard parts made from sturdy materials. 8 Colour Rotogravure Printing Machine is designed to support flexible packaging film manufacturing industry. Rotogravure print plant is an expert supplementary solution that can be added to the existing flexible packaging film plant as it can print on variety of materials including paper, flexible films, aluminum foils, etc. Rotogravure printing line is a suitable choice to print on lamination lines made of different ingredients. Investing on this supplementary machine is a favorable opportunity to reduce the cost of secondary packaging requirements. The first step of Gravure is to create the cylinder with the engraved images that need to be printed: the engraving process will create on the cylinder surface the cells that will contain the ink in order to transfer it to the paper. Since the amount of ink contained in the cells corresponds to different colour intensities on the paper, the dimensions of the cells must be carefully set: deeper cells will produce more intensive colours whereas less deep cells will produce less intensive ones. There are three methods of photoengraving that have been used for engraving of gravure cylinders, where the cell open size or the depth of cells can be uniform or variable. The information of 8 Colour Rotogravure Printing Machine is provided for the purpose of guideline & indication only and doesn't form any kind of commitments. 6 Colour Rotogravure Printing Machine is used in flexible packaging manufacturing and printing process including polyester, Nylon, BOPP, Foil, low and high density polyethylene polypro plane and paper with two sided printing facilities with high speed hot air dryers. The high speed rotogravure printing machine has the great flexibilities and high resolution color combination at faster rate. The rotogravure printing machine is well designed for precision engineering for best industry standard requirements of valued clients with technical excellence, easy machine operations with good efficiency and performance, high durability and reliability with standard parts made from sturdy materials. 6 Colour Rotogravure Printing Machine is designed to support flexible packaging film manufacturing industry. Rotogravure print plant is an expert supplementary solution that can be added to the existing flexible packaging film plant as it can print on variety of materials including paper, flexible films, aluminum foils, etc. Rotogravure printing line is a suitable choice to print on lamination lines made of different ingredients. Investing on this supplementary machine is a favorable opportunity to reduce the cost of secondary packaging requirements. Introducing sensitization resin as Rotogravure Printing Plate & Machines, it is suitable for printing, such packing materials as polyethylene, polypropylene bag, and cellophane and roll paper. It is a kind of ideal printing equipment for producing paper packing bags for food, supermarket handbags, vest bags and clothes bags. This is our high speed 6 Colour Rotogravure Printing Machine with 5 drive, web video & auto registration control system. It's a very nice & high profile machine. Rotogravure Printing Unit is used in flexible packaging manufacturing and printing process including polyester, Nylon, Bopp, Foil, low and high density polyethylene polypro plane and paper with two sided printing facilities with high speed hot air dryers. The high speed rotogravure printing machine has the great flexibilities and high resolution color combination at faster rate. The rotogravure printing machine is well designed for precision engineering for best industry standard requirements of valued clients with technical excellence, easy machine operations with good efficiency and performance, high durability and reliability with standard parts made from sturdy materials. Rotogravure printing machine is designed to support flexible packaging film manufacturing industry. Rotogravure print plant is an expert supplementary solution that can be added to the existing flexible packaging film plant as it can print on variety of materials including paper, flexible films, aluminum foils, etc. Rotogravure printing line is a suitable choice to print on lamination lines made of different ingredients. Investing on this supplementary machine is a favorable opportunity to reduce the cost of secondary packaging requirements. The information of rotogravure printing machine is provided for the purpose of guideline & indication only and doesn't form any kind of commitments. Rotogravure Printing Plant is used in flexible packaging manufacturing and printing process including polyester, Nylon, Bopp, Foil, low and high density polyethylene polypro plane and paper with two sided printing facilities with high speed hot air dryers. The high speed rotogravure printing machine has the great flexibilities and high resolution color combination at faster rate. The rotogravure printing machine is well designed for precision engineering for best industry standard requirements of valued clients with technical excellence, easy machine operations with good efficiency and performance, high durability and reliability with standard parts made from sturdy materials. Rotogravure printing machine is designed to support flexible packaging film manufacturing industry. Rotogravure print plant is an expert supplementary solution that can be added to the existing flexible packaging film plant as it can print on variety of materials including paper, flexible films, aluminum foils, etc. Rotogravure printing line is a suitable choice to print on lamination lines made of different ingredients. Investing on this supplementary machine is a favorable opportunity to reduce the cost of secondary packaging requirements. Rotogravure Printing Line (Roto or Gravure for short) is a type of intaglio printing process, which involves engraving the image onto an image carrier. In gravure printing, the image is engraved onto a cylinder because, like offset printing and flexography, it uses a rotary printing press. Once a staple of newspaper photo features, the rotogravure process is still used for commercial printing of magazines, postcards, and corrugated (cardboard) product packaging. The first step of Gravure is to create the cylinder with the engraved images that need to be printed: the engraving process will create on the cylinder surface the cells that will contain the ink in order to transfer it to the paper. Since the amount of ink contained in the cells corresponds to different colour intensities on the paper, the dimensions of the cells must be carefully set: deeper cells will produce more intensive colours whereas less deep cells will produce less intensive ones. There are three methods of photoengraving that have been used for engraving of gravure cylinders, where the cell open size or the depth of cells can be uniform or variable. Rotogravure Printing Line is designed to support flexible packaging film manufacturing industry. Rotogravure print plant is an expert supplementary solution that can be added to the existing flexible packaging film plant as it can print on variety of materials including paper, flexible films, aluminum foils, etc. Rotogravure printing line is a suitable choice to print on lamination lines made of different ingredients. Investing on this supplementary machine is a favorable opportunity to reduce the cost of secondary packaging requirements. This is our High Speed 6 color Rotogravure Printing Line with 5 drive, web video & auto registration control system. It's a very nice & high profile machine. During the Woven Sack Roll Rotogravure Printing Machine process the printing cylinder rotates in the ink pan where the engraved cells fill with ink. As the cylinder rotates clear of the ink pan, any excess ink is removed by the doctor blade. Further around, the cylinder is brought into contact with the substrate, which is pressed against it by the rubber covered impression roller. The pressure of the roller, along with the capillary draw of the substrate, results in the direct transfer of ink from the cells in the printing cylinder to the surface of the substrate. As the printing roller rotates back into the ink pan, the printed area of the substrate proceeds through a dryer and onto the next printing unit, which is normally a different color or may be a varnish or coating. Precise color to color registration is made possible via automatic side and length register control systems. For a web-fed printing press, after each color has been printed and any coatings applied, the web is 'rewound' into a finished roll. The process offers the ability to transfer ink consistently, across a wide range of densities, and at high speeds, making it suitable for applications which require high image quality, such as publishing, packaging, labels, security print, and decorative printing. The durable nature of the printing cylinders used makes gravure printing an ideal process for providing high quality print on very long or regularly repeating runs, delivering cost advantages over other processes. The modern day rotogravure printing press uses a printing cylinder which has been laser engraved with minute cells capable of retaining ink, the size and pattern of which reflect the required image. These cells are forced to transfer their ink directly onto the substrate by a combination of pressure and capillary action, so producing the printed image. The process, also commonly called gravure printing, is used in the manufacturing of food and non-food packaging, as well as labels, wall coverings, transfer printing, and has a variety of further applications in the security printing, industrial, and segments of industry. The Plastic Printing Line process is the most popular printing process used in flexible-packaging manufacturing, because of its ability to print on thin film such as polyester, OPP, nylon, and PE, which come in a wide range of thicknesses, commonly 10 to 30 micrometers. The policy made by the company makes us engaged in offering a quality assured range of Online Rotogravure Printing Machine. These machines are sturdy on design and are exceptionally valued by our precious clients. Besides being manufactured from pristine grade components and the latest technology, these are inspected properly by our quality examiners. Machines offered by us are available with us in several models at most reasonable price. The layout of a Paper Printing Machine follows an in-line arrangement where the required number of printing units is installed along a horizontal plane. Rotogravure Printing Machine For Plastic Film is used in flexible packaging manufacturing and printing process including polyester, Nylon, BOPP, Foil, low and high density polyethylene polypro plane and paper with two sided printing facilities with high speed hot air dryers. The high speed rotogravure printing machine has the great flexibilities and high resolution color combination at faster rate. The rotogravure printing machine is well designed for precision engineering for best industry standard requirements of valued clients with technical excellence, easy machine operations with good efficiency and performance, high durability and reliability with standard parts made from sturdy materials. Rotogravure Printing Machine For Plastic Film is designed to support flexible packaging film manufacturing industry. Rotogravure print plant is an expert supplementary solution that can be added to the existing flexible packaging film plant as it can print on variety of materials including paper, flexible films, aluminum foils, etc. Rotogravure printing line is a suitable choice to print on lamination lines made of different ingredients. Investing on this supplementary machine is a favorable opportunity to reduce the cost of secondary packaging requirements. Introducing sensitization resin as Rotogravure Printing Plate & Machines, it is suitable for printing, such packing materials as polyethylene, polypropylene bag, and cellophane and roll paper. It is a kind of ideal printing equipment for producing paper packing bags for food, supermarket handbags, vest bags and clothes bags. This is our high speed Rotogravure Printing Machine For Plastic Film with 5 drive, web video & auto registration control system. It's a very nice & high profile machine. Rotogravure Printing Machine For Alluminium Foil is used in flexible packaging manufacturing and printing process including polyester, Nylon, Bopp, Foil, low and high density polyethylene polypro plane and paper with two sided printing facilities with high speed hot air dryers. The high speed rotogravure printing machine has the great flexibilities and high resolution color combination at faster rate. The rotogravure printing machine is well designed for precision engineering for best industry standard requirements of valued clients with technical excellence, easy machine operations with good efficiency and performance, high durability and reliability with standard parts made from sturdy materials. Rotogravure printing machine is designed to support flexible packaging film manufacturing industry. Rotogravure print plant is an expert supplementary solution that can be added to the existing flexible packaging film plant as it can print on variety of materials including paper, flexible films, aluminum foils, etc. Rotogravure printing line is a suitable choice to print on lamination lines made of different ingredients. Investing on this supplementary machine is a favorable opportunity to reduce the cost of secondary packaging requirements. Rotogravure Printing Machine For Alluminium Foil (Roto or Gravure for short) is a type of intaglio printing process, which involves engraving the image onto an image carrier. In gravure printing, the image is engraved onto a cylinder because, like offset printing and flexography, it uses a rotary printing press. Once a staple of newspaper photo features, the rotogravure process is still used for commercial printing of magazines, postcards, and corrugated (cardboard) product packaging. 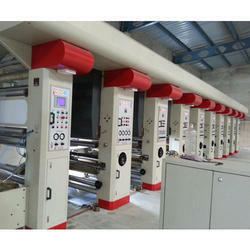 Rotogravure Printing Machine For Alluminium Foil is designed to support flexible packaging film manufacturing industry. Rotogravure print plant is an expert supplementary solution that can be added to the existing flexible packaging film plant as it can print on variety of materials including paper, flexible films, aluminum foils, etc. Rotogravure printing line is a suitable choice to print on lamination lines made of different ingredients. Investing on this supplementary machine is a favorable opportunity to reduce the cost of secondary packaging requirements. The layout of a Furniture Laminates Rotogravure Printing Machine press follows an in-line arrangement where the required number of printing units is installed along a horizontal plane. Single Color Rotogravure Printing Machine is used in flexible packaging manufacturing and printing process including polyester, Nylon, BOPP, Foil, low and high density polyethylene polypro plane and paper with two sided printing facilities with high speed hot air dryers. The high speed rotogravure printing machine has the great flexibilities and high resolution color combination at faster rate. The rotogravure printing machine is well designed for precision engineering for best industry standard requirements of valued clients with technical excellence, easy machine operations with good efficiency and performance, high durability and reliability with standard parts made from sturdy materials. Single Color Rotogravure Printing Machine is designed to support flexible packaging film manufacturing industry. Rotogravure print plant is an expert supplementary solution that can be added to the existing flexible packaging film plant as it can print on variety of materials including paper, flexible films, aluminum foils, etc. Rotogravure printing line is a suitable choice to print on lamination lines made of different ingredients. Investing on this supplementary machine is a favorable opportunity to reduce the cost of secondary packaging requirements. Introducing sensitization resin as Rotogravure Printing Plate & Machines, it is suitable for printing, such packing materials as polyethylene, polypropylene bag, and cellophane and roll paper. It is a kind of ideal printing equipment for producing paper packing bags for food, supermarket handbags, vest bags and clothes bags. This is our high speed 6 Colour Rotogravure Printing Machine with 5 drive, web video & auto registration control system. It's a very nice & high profile machine. Rotogravure Printing Machine is used in flexible packaging manufacturing and printing process including polyester, Nylon, Bopp, Foil, low and high density polyethylene polypro plane and paper with two sided printing facilities with high speed hot air dryers. The high speed rotogravure printing machine has the great flexibilities and high resolution color combination at faster rate. The rotogravure printing machine is well designed for precision engineering for best industry standard requirements of valued clients with technical excellence, easy machine operations with good efficiency and performance, high durability and reliability with standard parts made from sturdy materials. Rotogravure printing machine is designed to support flexible packaging film manufacturing industry. Rotogravure print plant is an expert supplementary solution that can be added to the existing flexible packaging film plant as it can print on variety of materials including paper, flexible films, aluminum foils, etc. Rotogravure printing line is a suitable choice to print on lamination lines made of different ingredients. Investing on this supplementary machine is a favorable opportunity to reduce the cost of secondary packaging requirements. The policy made by the company makes us engaged in offering a quality assured range of Multicolor Rotogravure Printing Machines. These machines are sturdy on design and are exceptionally valued by our precious clients. Besides being manufactured from pristine grade components and the latest technology, these are inspected properly by our quality examiners. Machines offered by us are available with us in several models at most reasonable price. BOPP Film Printing Press Machine is used in flexible packaging manufacturing and printing process including polyester, Nylon, Bopp, Foil, low and high density polyethylene polypro plane and paper with two sided printing facilities with high speed hot air dryers. The high speed rotogravure printing machine has the great flexibilities and high resolution color combination at faster rate. The rotogravure printing machine is well designed for precision engineering for best industry standard requirements of valued clients with technical excellence, easy machine operations with good efficiency and performance, high durability and reliability with standard parts made from sturdy materials. 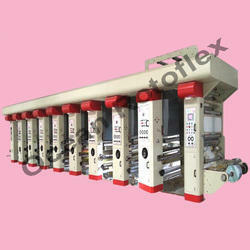 BOPP Film Printing Press Machine is designed to support flexible packaging film manufacturing industry. Rotogravure print plant is an expert supplementary solution that can be added to the existing flexible packaging film plant as it can print on variety of materials including paper, flexible films, aluminum foils, etc. Rotogravure printing line is a suitable choice to print on lamination lines made of different ingredients. Investing on this supplementary machine is a favorable opportunity to reduce the cost of secondary packaging requirements. Introducing sensitization resin as Rotogravure Printing Plate & Machines, it is suitable for printing, such packing materials as polyethylene, polypropylene bag, and cellophane and roll paper.It is a kind of ideal printing equipment for producing paper packing bags for food, supermarket handbags, vest bags and clothes bags. The policy made by the company makes us engaged in offering a quality assured range of Rotogravure Printing Machine. These machines are sturdy on design and are exceptionally valued by our precious clients. Besides being manufactured from pristine grade components and the latest technology, these are inspected properly by our quality examiners. Machines offered by us are available with us in several models at most reasonable price. The policy made by the company makes us engaged in offering a quality assured range of Foil Printing Machine. These machines are sturdy on design and are exceptionally valued by our precious clients. Besides being manufactured from pristine grade components and the latest technology, these are inspected properly by our quality examiners. Machines offered by us are available with us in several models at most reasonable price. During the Plastic Printing Machine process the printing cylinder rotates in the ink pan where the engraved cells fill with ink. As the cylinder rotates clear of the ink pan, any excess ink is removed by the doctor blade. Further around, the cylinder is brought into contact with the substrate, which is pressed against it by the rubber covered impression roller. The policy made by the company makes us engaged in offering a quality assured range of Automatic Plastic Printing Machine. These machines are sturdy on design and are exceptionally valued by our precious clients. Besides being manufactured from pristine grade components and the latest technology, these are inspected properly by our quality examiners. Machines offered by us are available with us in several models at most reasonable price. Plastic Printing Plant is used in flexible packaging manufacturing and printing process including polyester, Nylon, Bopp, Foil, low and high density polyethylene polyproplane and paper with two sided printing facilities with high speed hot air dryers. The high speed rotogravure printing machine has the great flexibilities and high resolution color combination at faster rate. The rotogravure printing machine is well designed for precision engineering for best industry standard requirements of valued clients with technical excellence, easy machine operations with good efficiency and performance, high durability and reliability with standard parts made from sturdy materials. Plastic Printing Plant is designed to support flexible packaging film manufacturing industry. Rotogravure print plant is an expert supplementary solution that can be added to the existing flexible packaging film plant as it can print on variety of materials including paper, flexible films, aluminum foils, etc. Rotogravure printing line is a suitable choice to print on lamination lines made of different ingredients. Investing on this supplementary machine is a favorable opportunity to reduce the cost of secondary packaging requirements. 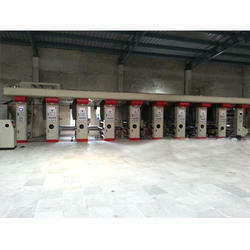 The policy made by the company makes us engaged in offering a quality assured range of Gravure Printing Press Machine. These machines are sturdy on design and are exceptionally valued by our precious clients. Besides being manufactured from pristine grade components and the latest technology, these are inspected properly by our quality examiners. Machines offered by us are available with us in several models at most reasonable price. Gravure printing press machine is designed to support flexible packaging film manufacturing industry. Rotogravure print plant is an expert supplementary solution that can be added to the existing flexible packaging film plant as it can print on variety of materials including paper, flexible films, aluminum foils, etc. Rotogravure printing line is a suitable choice to print on lamination lines made of different ingredients. Investing on this supplementary machine is a favorable opportunity to reduce the cost of secondary packaging requirements. Web width 300mm to 1500mm. Heavy frame structure to eliminate vibration. Highly efficient gear box with spiral bevel gears. Doctor blade with oscillation for long life of cylinder. Ergonomically design - operators best choice. Infeed-outfeed, inline slitting, inline lamination, weballigner, tension contollers, multi drive systems, ink circulation pump, web video, auto colour registration. Rotogravure Printing Machine Line (Roto or Gravure for short) is a type of intaglio printing process, which involves engraving the image onto an image carrier. In gravure printing, the image is engraved onto a cylinder because, like offset printing and flexography, it uses a rotary printing press. Once a staple of newspaper photo features, the rotogravure process is still used for commercial printing of magazines, postcards, and corrugated (cardboard) product packaging. Rotogravure Printing Machine Line is designed to support flexible packaging film manufacturing industry. Rotogravure print plant is an expert supplementary solution that can be added to the existing flexible packaging film plant as it can print on variety of materials including paper, flexible films, aluminum foils, etc. Rotogravure printing line is a suitable choice to print on lamination lines made of different ingredients. Investing on this supplementary machine is a favorable opportunity to reduce the cost of secondary packaging requirements. Roll To Roll Rotogravure Printing Machine (Roto or Gravure for short) is a type of intaglio printing process, which involves engraving the image onto an image carrier. In gravure printing, the image is engraved onto a cylinder because, like offset printing and flexography, it uses a rotary printing press. Roll To Roll Rotogravure Printing Machine is designed to support flexible packaging film manufacturing industry. Rotogravure print plant is an expert supplementary solution that can be added to the existing flexible packaging film plant as it can print on variety of materials including paper, flexible films, aluminum foils, etc. Rotogravure printing line is a suitable choice to print on lamination lines made of different ingredients. Investing on this supplementary machine is a favorable opportunity to reduce the cost of secondary packaging requirements.